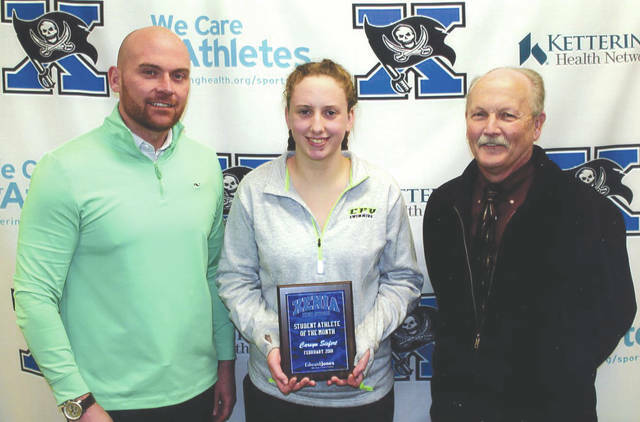 Carsyn Siefert, center with Xenia Athletic Director Nathan Kopp and Mike Reed of Edward Jones Investments, was chosen as the Edward Jones Investments Athlete of the Month for February for Xenia High School. This award is being sponsored by the office of Mike Reed at Edward Jones Investments of Xenia, serving Xenia, Jamestown, Cedarville and surrounding areas. Reed, a junior on the swimming team, is a motivated and positive student and athlete. She is an active participant in many clubs and organizations and is a hard worker in the classroom. She is a positive and encouraging student leader — the epitome of a student-athlete. https://www.fairborndailyherald.com/wp-content/uploads/sites/50/2018/04/web1_CorsynSiefert_PS.jpgCarsyn Siefert, center with Xenia Athletic Director Nathan Kopp and Mike Reed of Edward Jones Investments, was chosen as the Edward Jones Investments Athlete of the Month for February for Xenia High School. This award is being sponsored by the office of Mike Reed at Edward Jones Investments of Xenia, serving Xenia, Jamestown, Cedarville and surrounding areas. Reed, a junior on the swimming team, is a motivated and positive student and athlete. She is an active participant in many clubs and organizations and is a hard worker in the classroom. She is a positive and encouraging student leader — the epitome of a student-athlete.